The Low Water Sensor has been updated! Click here for the new version. The water reservoir is in the back. 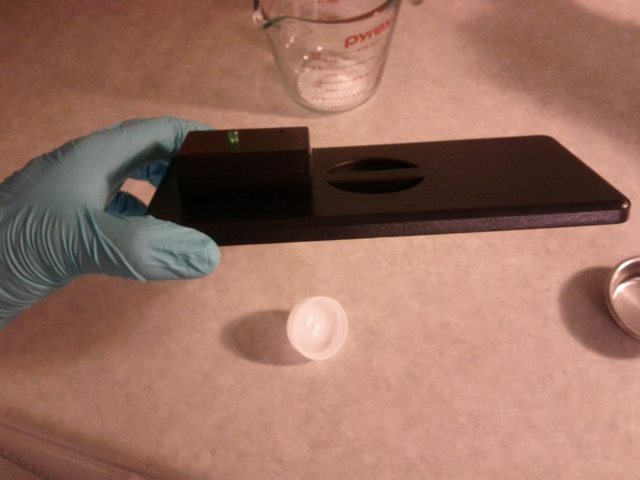 You can't normally see what's in it or how low it is without taking off the lid and peeking. Start a brew without enough water to finish it, and your brew is ruined. When water is low, a green LED blinks gently as a reminder to fill up. It uses tiny amounts of power - the CR2023 coin cell used for power will chemically expire before it is ever actually exhausted. Can you see the blink? The first (and 2nd, 3rd, etc) versions of the idea were ridiculously complex compared to what I finally made. I'm really proud of this thing, not only how well it works and looks (especially for being a junk box project) but also the process of whittling it down to bare bones functionality. The fishing line is connected to the spring, just like a fishing rod. On the other end of the line is a floater made from a water bottle cap. Here is a functional diagram showing the main parts. Click to enlarge. [Added 2013-05-03] A Flashing LED is a special kind of LED that has some electronics built into it. I like the flashing, but if you don't need it to actually flash, then it would be fine to use a regular (non-flashing) high-brightness LED. In that case, electrically your indicator would be not much different than an LED throwie. I built this hardware into a small plastic enclosure that matched my reservoir lid. 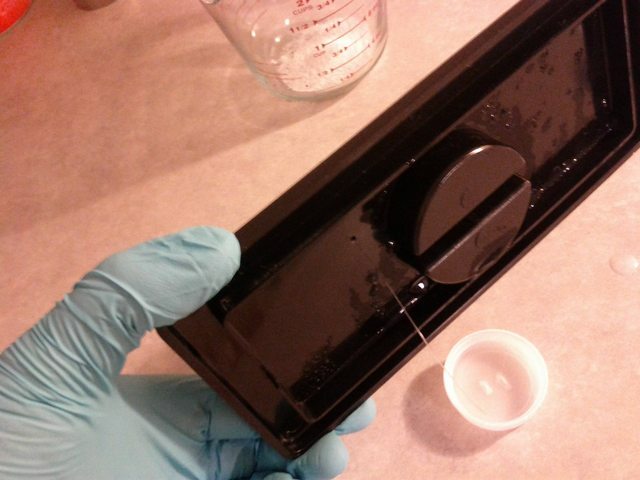 I drilled a small hole through the enclosure and lid for the fishing line and floater. Here is what my new reservoir cover looks like. I used a water bottle cap as the floater. 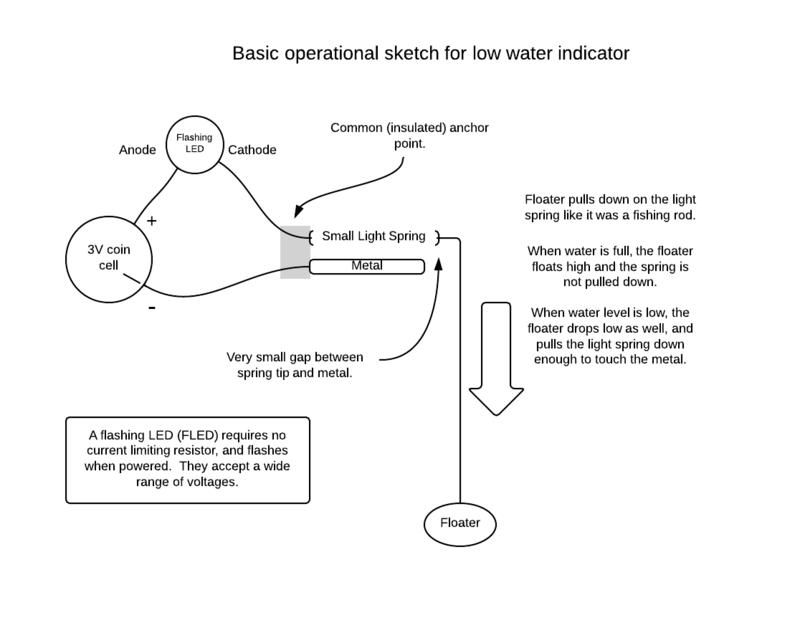 When the water level falls low enough, the weight of the floater pulls down on the spring which closes the circuit between the LED and the battery. Dirt simple, and uses no power at all when not actually lit. You are making coffee, and as soon as the water gets low the LED starts to flash a little uncertainly at first then quickly settles into a regular pulse. Bonus is that power consumption is even better than I thought it would be, because it never spends any significant amount of time flashing unattended. The only time the machine uses water is when it's actively being used, so the LED never starts blinking when no one is around. As soon as it's blinking, I finish brewing then top up the water. I should have made this thing ages ago, but more importantly it demonstrates the idea of "the simpler, the better." It is not only cheaper and simpler than my first designs (which used electronics including a pressure sensor) but is perfectly reliable. Also, with no electronics or active sensors to feed or keep awake it is pretty much impossible to use less power than it does right now. The Low Water Sensor has been updated: click here for the new version.